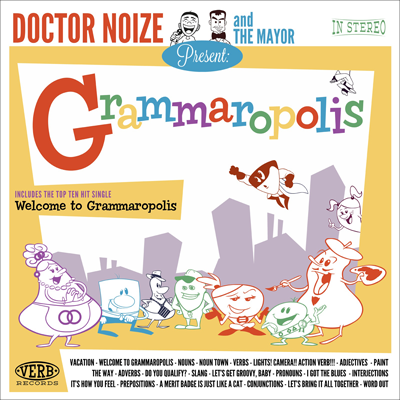 Since I'm on a grammar kick of late, I should mention a second source of no-really-it's-fun learning on the subject that Dash has been obsessed with lately: Grammaropolis, an album of songs about language and parts of speech. The CD came out earlier this year, but recently came to my attention on its reissue with a new iPad/iPhone app, which nicely complements the subscription-based learning Grammaropolis website. If this sounds like a little entertainment-based-learning empire, that's because it is; former middle-school teacher and current children's-book author Coert Voorhees, aka the Mayor of Grammaropolis, devised the website—which anthropomorphizes parts of speech to show what they do and how they work, giving each its own "neighborhood" kids can explore. (It's been a real success, winning the National Parenting Center's Seal of Approval this year; it costs $3.99 a month, or $34.99 annually to subscribe.) The new Word Sort by Grammaropolis iPad/iPhone app ($1.99) adds a game to the proceedings, in which kids try to put each word in its proper category. But its the album itself, which features both the Mayor himself and songs by kids' musician Doctor Noize, that is delighting our seven-year-old most right now. The good Doctor—known in real life (I assume) as Cory Cullinan—proves quickly to be a master of pastiche rivaling the creators of the classic Schoolhouse Rock bits (he even tosses in a few sly references to them—e.g., a repeated "hallelujah" in the backing vocals to a techno-tinged sing about interjections). Cullinan is also an alarmingly accomplished musician, not only writing and arranging the clever songs in a multitude of styles (everything from classic silent-movie-accompaniment piano to a Steely Dan homage) but also playing nearly every instrument you hear—keyboards, guitars, horns, you name it. Most of all, though, both the Doctor and the Mayor are funny, which is really what makes the album irresistible to kids. (A particular favorite of Dash's is the song in which the supercool character Slang crashes a radio program on which the Mayor had intended to stuffily condemn nonstandard vocabulary.) And that, in turn, lets all the grammar lessons the songs are really about just seep in without really even feeling like learning. As those of us who can still recite the preamble to the U.S. Constitution mainly because Schoolhouse Rock set it to music all those years ago, it's remarkably effective.